The quest for crunchy baked french fries ends here! Making fries at home should be something enjoyed regularly. Sadly, most online versions disappoint. Say good-bye to limp, floppy potatoes. Say hello to fries that have a longer table-life than the standard drive-through dash. 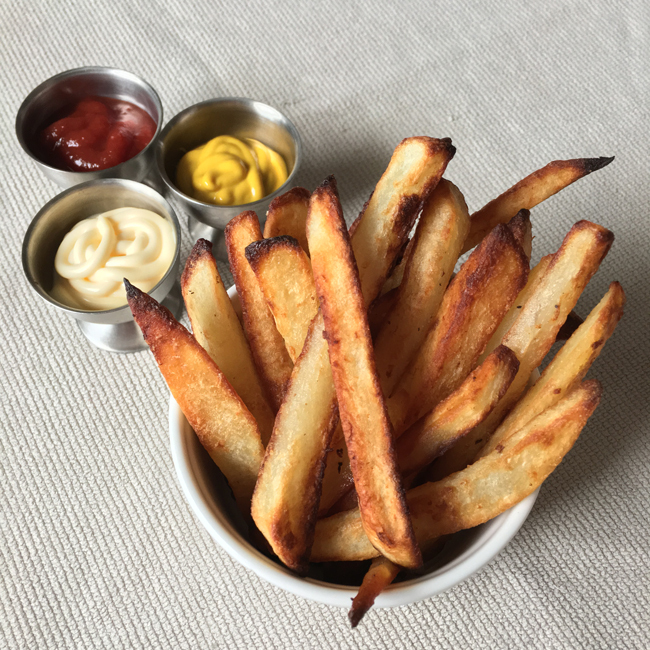 The secret to these fries is a quick boil in a baking soda bath. The edges of the fries get roughed up nicely, so when they bake in the oven they get the crunchy outside paired with a creamy inside. Prep. Preheat oven to 525° F. Bring a pot of salted water to a boil. Peel potatoes. Slice lengthwise, divide into two stacks, then slice again into long strips. Try to cut the potatoes into the same thickness around, the skinnier the better. Blanch the potatoes. When the water is boiling, add baking soda, then the potatoes. Baking soda is essential to final texture, do not skip! Boil for 3-4 minutes, then drain. Toss with some butter and olive oil, then sprinkle with salt and toss again. The more roughed up they get, the crunchier they’ll be. Bake the fries. Spread the fries onto several baking sheets lined with parchment paper, arranged into single layers. Bake for 15-20 minutes, turning occasionally, until browned.